Company: Apistogramma agassizii (Agassiz' Dwarf Cichlid ) is best kept with other small species. Aquarium setup: Apistogramma agassizii (Agassiz' Dwarf Cichlid) should be kept in a well planted aquarium with a lot of hiding places. Make sure to offer a lot of small caves. 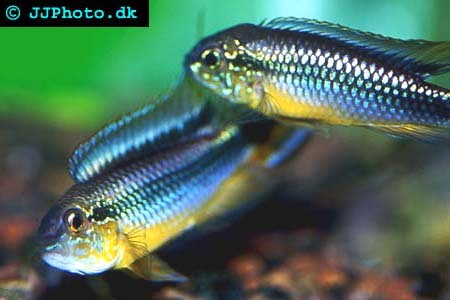 Apistogramma agassizii (Agassiz' Dwarf Cichlid) is best kept in small harem groups with one male for every 3-4 females. Feeding: Apistogramma agassizii (Agassiz' Dwarf Cichlid ) prefers frozen food. They need a varied diet and should not be kept on flake food alone even if some fish accept flake food. Breeding: Apistogramma agassizii (Agassiz' Dwarf Cichlid) lays their eggs in caves. The egg and fry is guarded by the female while the male guards it¨s territory which may include several females with fry or eggs. Each spawning usually only results in a smaller number of fry.